I’ve got a newfound love for zucchini. I picked up these yellow ones at the farmer’s market because they were too beautiful to ignore. The longer this dish marinates in the fridge the better it tastes. I used a mandolin to get the beautiful ribbons but you can just slice the zucchini into rounds if you don’t own one. This recipe is great for summer potlucks! * I found this type of Greek cheese at my local farmer’s market. You could substitute this for a number of different hard, salty cheeses such as ricotta salata, pecorino romano or feta. In a large bowl whisk together olive oil, lemon juice, garlic, sugar and salt and pepper. 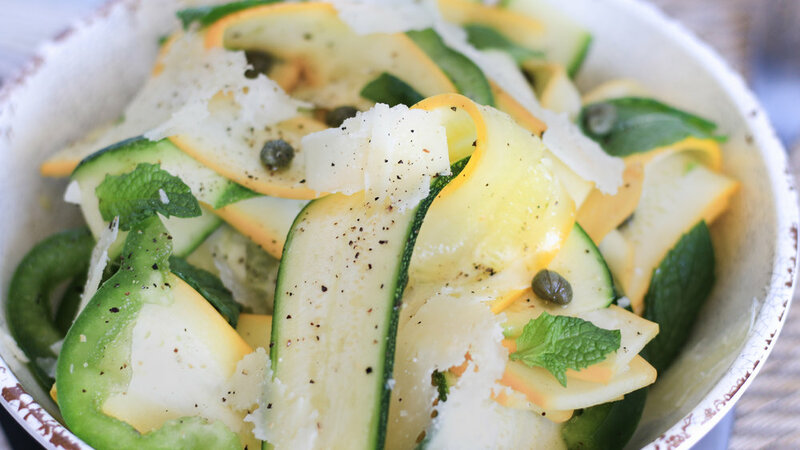 Gently toss with zucchini ribbons, green pepper, capers and mint. Cover and refrigerate for 2 hours, or overnight. Before serving top with shaved cheese and additional mint leaves. Season with salt and pepper.